Composed of the world’s five largest emerging economies, the BRICS has commonly been perceived in competition with the G7, a group of industrialized, democratic and developed states. Since the inception of BRICS summitry in 2009, most popular commentary and analysis have focused on the respective growth rates of the G7 and the BRICS, notably projecting that BRICS economies will overtake the G7’s share of world gross domestic product in upcoming decades. However, beyond this revisionist and “new order” interpretation of the BRICS’s rise, a closer examination of the G7 and the BRICS reflects more similarities in their summit priorities than conventionally noted. This is particularly true of this year’s summitry, comparing the agenda of G7’s Canadian presidency with South Africa’s priorities for the BRICS Johannesburg Summit in July. First, Canadian prime minister Justin Trudeau’s leadership on gender equality at Charlevoix this past June will also be emphasized by this year’s BRICS president. One of South Africa’s summit priorities, empowering women and particularly women in developing countries, echoes the ambitious G7 commitment to fund quality education for young girls in conflict zones and crisis situations. The Charlevoix Summit catalyzed a total pledge of $3.8 billion for this cause. Looking to South Africa’s proposed establishment of a BRICS gender and women’s forum, one can expect to see further aspiring gender targets set this summer. Second, both the G7 and the BRICS share a strong institutional interest in upholding a liberal and open trade order. Not only do both presidencies note the importance of inclusive growth and development, but both institutions are also working hard to reaffirm, by consensus and implementation, the importance of integrated trade and investment markets. Both the BRICS and the G7 have members with protectionist inclinations, making economic cooperation an agenda item of mutual concern far beyond this year’s summitry. The BRICS Xiamen Summit in 2017 produced agreements to foster collaboration in trade, innovation and customs, under the framework of the BRICS Economic Partnership Strategy established in 2015. All BRICS and G7 members also participate in the G20 process, where most members will further consolidate their collective interest in free trade and combatting market-distorting measures. Third, the G7 and the BRICS share a supportive perspective on the development of the African region. The African Union’s Agenda 2063 was mentioned in both the 2017 Taormina and 2018 Charlevoix G7 communiqués, reaffirming the G7’s support through a model of partnership with Africa. On the other hand, by virtue of South Africa’s BRICS presidency, the theme of the summit this year will be “BRICS in Africa: Collaboration for Inclusive Growth and Shared Prosperity in the 4th Industrial Revolution,” also indicating a focus on regional development. In light of the New Development Bank, a BRICS-led initiative to provide project financing to developing countries, the agenda item of development will be especially pertinent to BRICS discussions this year. Furthermore, the outreach program of both G7 and BRICS summits this year invited Rwanda, the chair of the African Union, as well as Senegal, the chair of the New Partnership for Africa’s Development and Heads of State and Government Implementation Committee. As the only African member of the G20, South Africa thus plays a key role in vocalizing this issue area in international summit institutions. Although views of the BRICS as a revisionist challenge to the liberal international system will persist, it is important to recognize that the significance of the BRICS complements (rather than contends with) G7 efforts to promote female empowerment, free trade, and development in Africa. The BRICS represents a critical and growing part of global governance. In order to appreciate BRICS’ contributions and role in sustainable global development, it is important to look past the “clash of paradigms” fallacy of East versus West, and rather identify areas of shared concern to both the G7 and the BRICS. The mentality of contestation for global influence and legitimacy must be put aside to see the potential for shared dialogue and partnership. Angela Min Yi Hou is the editor of the BRICS Research Group, incoming co-chair of summit studies with the G7 Research Group and a compliance director with the G20 Research Group. She is entering her fourth year of undergraduate studies at the University of Toronto, pursuing a double major in international relations and contemporary Asian Studies. 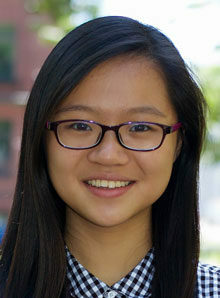 Angela’s academic interests focus on China’s role in global governance and international institutions. She was a member of the field teams at the G20 summit in Hamburg in Germany in 2017, the G7 summit in Charlevoix in Canada in 2018, and the (upcoming) BRICS summit in Johannesburg in South Africa in 2018.